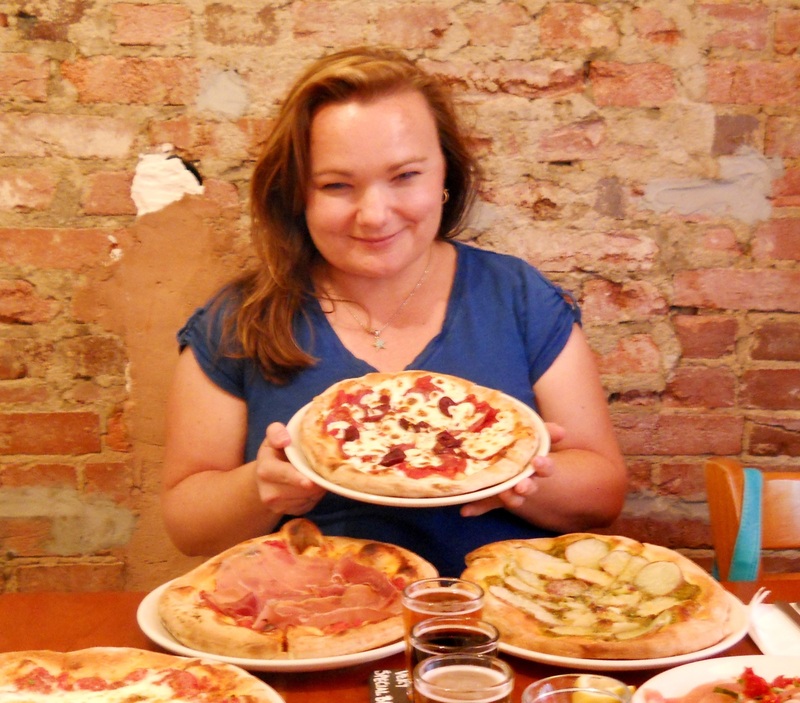 Last month, Liz Barrett, the former editor of PMQ Magazine (the industry’s pizza trade magazine), released a book titled Pizza: A Slice of American History. The book focuses on different pizza styles from around the country and contains stunning photos, recipes, and interviews with pizza experts. I recently had time to catch up with Liz and grill her (no pun intended) about her passion for pizza and affinity for Home Alone. You cover the evolution of many pizza styles in your book. What’s your favorite and why? I’m an equal-opportunity pizza lover. I really do like all of the pizza styles out there. However, when I sit down and list the pizzerias that I find myself returning to again and again, they are usually those serving Neapolitan- style pizzas. I think it’s the simplicity that I keep coming back to with the Neapolitan style—you can taste every ingredient, which I love. Let’s talk about the cover of the book. Tell us about where this pizzeria is located and why, for you, this captured the essence of the book? 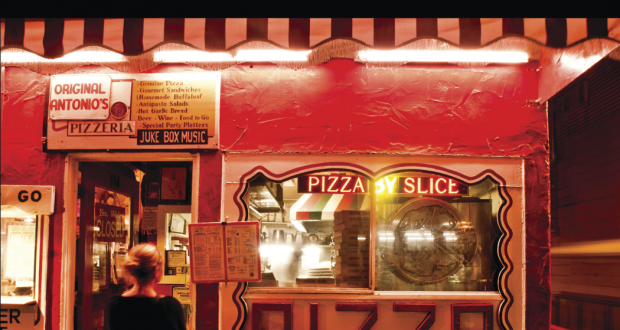 I do agree that the pizzeria on the cover captures the essence of pizza—and the book, but I did not choose the photo. My awesome book designers found that photo and knew immediately that it said everything I wanted to say. The pizzeria is Original Antonio’s, and it’s located in Avalon, California, on Catalina Island. I know you from back in the day as the editor of PMQ Pizza Magazine. 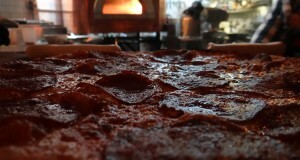 Were you always a huge pizza fan or did you come to love it as a result of your profession? Just like everyone in America, I’ve always loved pizza. But was I going to five pizzerias a day while on vacation? No way! The pizza fandom didn’t begin until I took the job with PMQ in 2007. I went from the once-every-couple-of-weeks pizza eater to the girl who maps out pizzerias and snaps 15 photos, checking things like “charring” before taking my first bite. It was a whole different world, but so much fun! I’ve always said that the people in the pizza industry are the most fun and down-to-earth people you could ever meet. I think it’s something in the sauce. You write in the book about the first pizza you ever ate — from the Wagon Wheel Saloon in Michigan in the mid 1980s. I’ve always believed in something called hometown bias, where people tend to overrate pizzerias from their childhood. Did you notice that during your research for this book? I can agree with that to a certain extent. Every memory from our past affects our future decisions in some way or another. I admit that when I come across a Detroit-style pizza nowadays (it’s rare), I get really excited! However, I don’t go searching them out, either. My palate has changed to where I prefer lighter crusts, such as the Neapolitan-style I mentioned before. I think it also has to do with the variety of pizzas and the distance one has traveled from their hometown. Someone who has lived in the same general area their entire life will have more hometown bias than someone like you or me who travel around trying various pizza styles, in theory. The first chapter is dedicated to Neapolitan style pizza — something that was pretty difficult to find in the States prior 10 or 15 years ago. What do you attribute the rise of this type of pizza to? 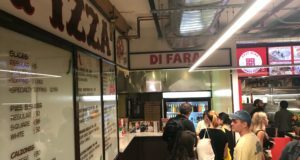 When the Associazione Verace Pizza Napoletana came together in 1984 to form a nonprofit group that would certify pizzerias as “authentic Neapolitan,” many pizzerias signed up to be labeled “authentic.” From there, more jumped on the bandwagon, some taking the authentic route, and others mimicking the style, which continues to grow in popularity today. You write in your book about pizza scenes from famous movies. Which is your favorite and why? Chapter 13 of your book deals with “more pizza styles” highlighting dozens of lesser known styles. What’s one you’d like to see gain popularity? Oh, good question! I listed a lot of them, but I think the one I’d most like to see spread across the nation is the grilled pizza. Yum! Everyone knows about New York and Chicago style pizza. But you dedicate an entire chapter to Detroit style pizza. Tell us more about that. I guess we can chalk this one up to hometown bias. I’m originally from Michigan and lived there until the family moved to Los Angeles when I was 13. Detroit-Style pizza was getting a lot of play a couple of years back; one of the big pizza chains even named a pizza after it. That crispy crust and caramelized-cheese edge deserved its own chapter, and I still think the style has a chance to spread to more pizzerias. Tell us about the difference between Sicilian pizza and Grandma pizza. People often use the two interchangeably. They are very similar. 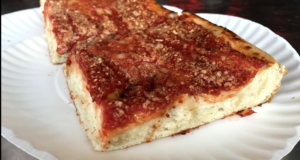 On a basic level, the Grandma pizza is a thinner version of the Sicilian pizza. Whichever one you end up with, they are both delicious. The Sicilian is usually light and airy on the inside with a delightful crunch on the bottom, and the Grandma slices pack a more powerful crunch since they are thinner. Wish I had a couple of slices right now! What’s one thing that should never go on pizza? A piano. Seriously, I think pizza is a blank canvas. Who am I to tell someone what they should have on their pizza? If it makes you happy and gets you eating more pizza, live it up!